Rufus has a new nest. Actually, he’s been zonking out on the bathmat intermittently since we first started letting him explore the house without supervision. And why not? It’s certainly no less comfortable than the grass he slept on for many years. It’s in a room that stays at a comfortable temperature, even when the rest of upstairs is too hot or too cold. There’s a water bowl a few steps away. 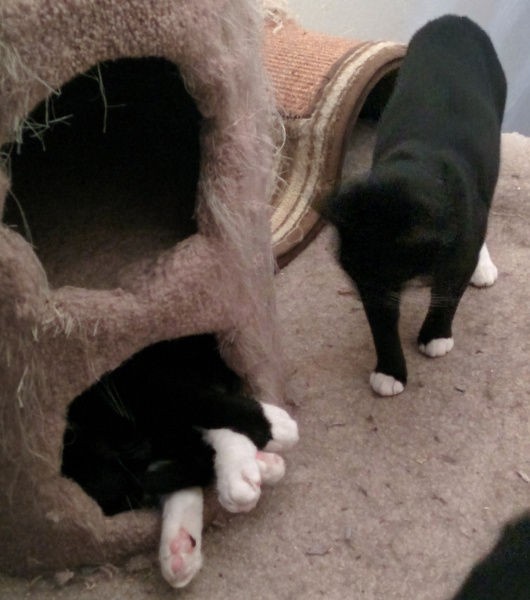 And ‘Nuki hardly ever goes in there. The only downside is that his nest gets too wet to be comfortable when the bipeds use the shower. Fortunately, there’s no shortage of alternative sleeping nooks. Everyone has their own favored sleeping positions. On the back, curled on the left side, hanging upside down from the cave roof. Rhubarb has one of the most specific comfort positions I’ve ever encountered. 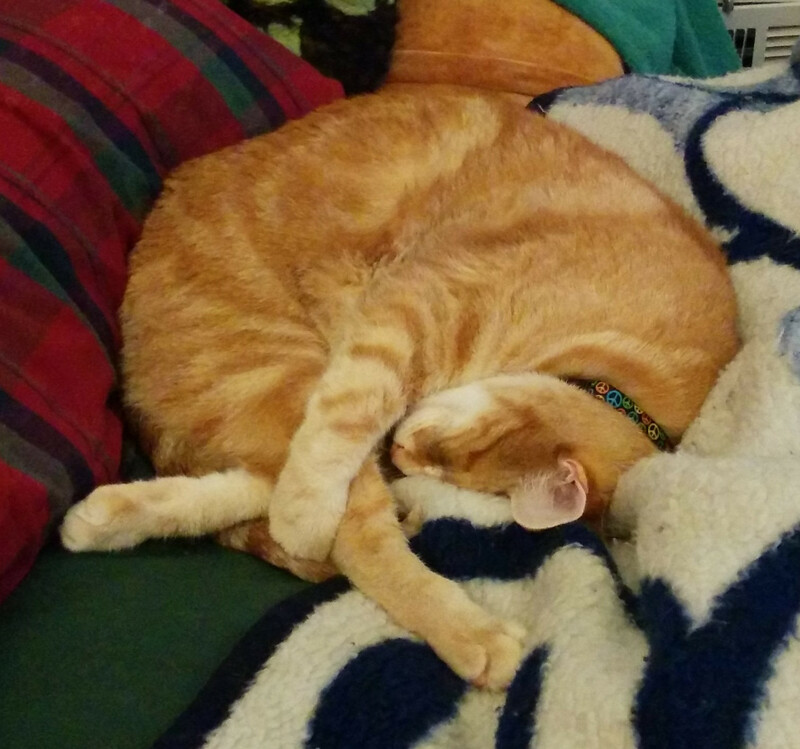 Note the careful alignment of the tail, so that the tip won’t brush his nose if it twitches in his sleep; the careful crossing of the left front leg and the right rear leg; and, of course, the all-important placement of the right front leg, the paw set just where it needs to be to hold the rear leg. And what of the left rear leg? Where’s that? Look closely. Very closely. If you peek between the tip of Rhubarb’s nose and the angle where the right legs overlap, you can see just a hint of the left rear leg. That’s right. It’s under his head, serving as a very fine, very snuggly pillow. Ah, to be even half that flexible! Watanuki has some strange habits. Other than his fascination with the fabric arts and his poetry, I mean. Take his sleeping posture, for example. 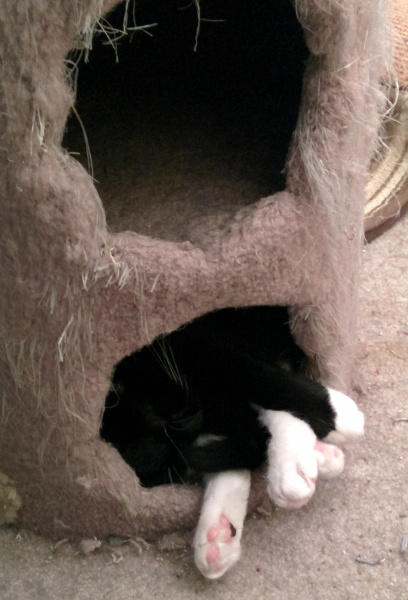 How can he possibly be comfortable with his tail woven between his legs and his paws dangling in the air? Yet he must be satisfied, because he frequently sleeps that way, and for hours at a time. Interestingly, it’s not a feline thing. Sachiko follows “Big Brudder Nookles” around the house, imitates his habits, and seems to worship him, albeit in a very feline non-deferential way. She’s just as puzzled as we are. As I write this, Kaja is snoozing in Maggie’s desk chair. Kokoro is snoring on the bed. Yuki and Rhubarb are dozing on the stairs. And Watanuki is curled up with his magic banana, sleeping on the dining room floor. Notice a pattern here? Yeah, I’m the only one awake in the house. A minor miracle, given the number of Feline Sleep Rays (FSRs) being generated. Cats have a near-magical ability to force even the most alert human to pass out within minutes. It’s simple: sit down with a cat in your lap. Pat the cat until he or she relaxes and goes to sleep. Almost instantly, your eyelids will begin to droop; shortly after, your chin will be bouncing off of your chest. Frighteningly, the cat doesn’t actually need to be in your lap. A cat sleeping on chair across the room is nearly as effective as one in contact with you. My own research suggests that unlike Wi-Fi, the strength of the signal is not attenuated by passing through walls. Even worse, the FSRs are apparently not radiated. Radiated electromagnetic signals weaken as a factor of the square of the distance (double the distance and the strength drops to a quarter). FSRs retain an astonishing 90% of their power across the length of the typical home. That suggests that they are actually focused beams directed as specific targets, rather than general broadcasts. They don’t appear to track moving targets well: you can fight off the effect of an FSR by moving around. As soon as you stop moving, though, the FSR will reacquire its target (you). Interestingly, there seems to be an inverse relationship between feline size and the ability to generate FSRs: on average, kitten-generated rays are 4.2 times as strong as those produced by fully-grown felines. Current scientific speculation is centered around the well-known fact that kittens purr much more loudly than adults; studies suggest that there may be a sub-sonic audio component to the FSR which is produced through a mechanism similar to purring. With all of their awesome potency, why don’t more people know about FSRs? Conspiracy theories that the CIA and FBI are hiding information about FSRs to cover up their use in covert operations are clearly nonsense: nobody has ever figured out a way to get a cat to take orders. Can you imagine walking up to a foreign embassy with a kitten in your pocket and then trying to convince it to go to sleep so you can sneak past the guards to plant a bug? My suspicion is that the powerful Ambien® lobby is suppressing the information while they try to figure out how to monetize it. Fortunately, there are significant issues that would have to be overcome to make packaging FSR generators, as the brains behind the bonsai kitten discovered back in 2001. So now the information is out. If this post fails to show up in Google or vanishes from this site, you’ll know the coverup is factual, and I’m sleeping with the fishes instead of the felines.